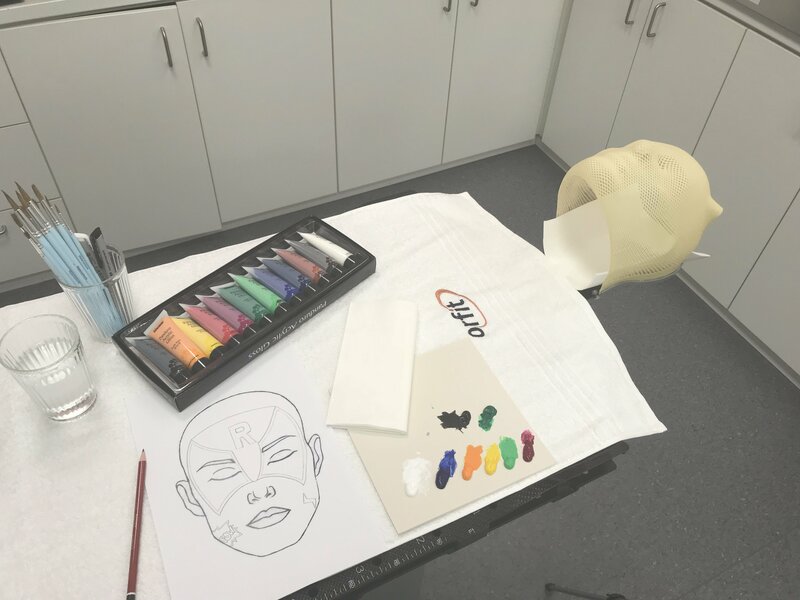 This tutorial focusses on the Orfit Nanor material and Proton Therapy mask. Go straight to the video tutorial. After interviewing staff who decorate masks in radiation therapy departments all over the world, we are confident that going that extra mile for a young patient means everything. A painted mask may comfort and help young children and their families through radiotherapy. It can reduce feelings of anxiety and claustrophobia. It might even prevent the use of anesthesia for each fraction. Read the value in decoration of paediatric immobilization masks here. To help anyone who is intrigued by all the creatively decorated masks out there, but does not know how or where to start, we created these tutorials. Keep an eye out for the next tutorial in these series or subscribe to our newsletter to have them send to you. We will break the tutorial down into small steps and show you which materials to use, where to find ideas and how to easily execute them. The moulded (paediatric) mask, completely hardened (minimum 24 hours after the moulding). Something to secure the mask on, e.g. a baseplate. This is especially the case for a Nanor proton therapy mask because of the thin material and the unique locking mechanism. A non-permanent water-soluble marker or a pencil. A paper plate or piece of cardboard. A cup of clean water. A paper towel or a guest towel. A template to draw out your design. If you have a specific logo or design, print it out and keep the print close by as a reference. Ask the patient about his or her favourite thing, it can be a character of a cartoon, or they can really love dinosaurs or a specific superhero. 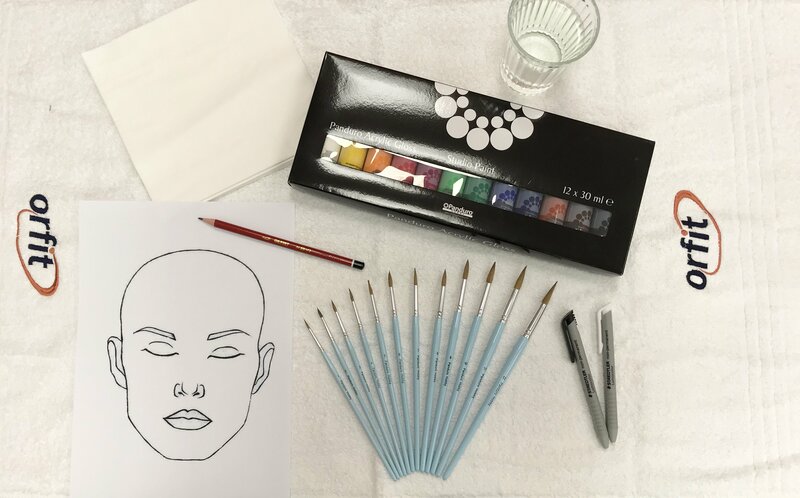 Draw out your design on paper, for the shape of a face you can use a template for face painting. Download the one we used here. If you have no idea how to start the design, search for e.g. 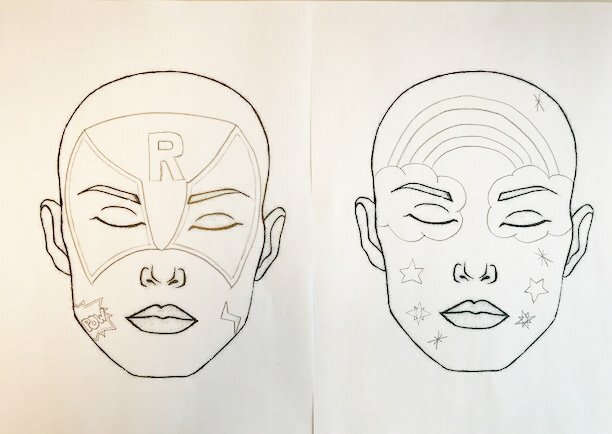 “superhero + face painting design” on the internet. Guaranteed you’ll find great designs and/or tutorials. Start by placing dots as reference points and to create symmetry. Keep your wrist in a loose position. If you feel like you can’t draw a straight line, sketch your line by making short strokes. Remember you have your eraser on hand to correct any mistake. Take a step back once in a while to check the proportions and adjust if necessary. Disclaimer: Always make sure that the materials used will not interfere with the treatment. Orfit is not responsible for any consequences of not following the guidelines above. Orfit offers a full range of products dedicated to paediatric patients. It contains base plates, head supports and thermoplastic masks. After interviewing staff who decorate masks in radiation oncology departments all over the world, we could conclude that going that extra mile for a young patient makes all the difference. To help anyone who is intrigued by all the creatively decorated masks out there, but does not know how or where to start, we created this tutorial series.